Maritime safety equipment and servicing provider Viking Life-Saving Equipment has announced that its electrically propelled LifeCraft passenger evacuation system has successfully completed full-scale heavy-weather sea trials (HWST). Developed and tested over the past 10 years, the new evacuation system, which can be incorporated into new and existing vessels, has been designed to combine the self-propelled maneuverability of lifeboats with the flexibility, comfort and smaller footprint of life rafts. 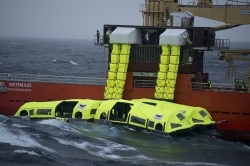 The solution comprises four inflatable survival crafts, each with four electric motors (one positioned at each corner) and capacity of 203 persons, and a self-contained stowage and launching appliance placed on deck or built into the ship’s side. The HWST took place on the North Sea between southern Norway and the UK. It involved multi-phased launches and testing of the LifeCraft system to evaluate how it performs in high winds, stormy seas and extreme weather conditions. After being ballasted with 70 tons to simulate full capacity, the LifeCraft was subjected to wind gusts with speeds of up to 18m/s (59ft/s) in addition to wave heights of 3.6-4.6m (11.8-15ft). Peak waves of 10m (32.8ft) exceeded the required 3m (9.8ft) needed for the trials, with personnel from Viking and DNV GL – acting on behalf of the Danish Maritime Authority (DMA) – battling seasickness and heaving decks to conclude the tests. “We launched the LifeCraft with the ship heading 3kts up against the wind, exposing the system to the full force of the fierce weather in the most critical test phase,” said Niels Fraende, VP, Cruise & LifeCraft. “We then demonstrated – with a simulated dead ship condition – that the fully loaded LifeCraft system provides a safe and stable means of evacuation on both the weather and lee sides for several hours. 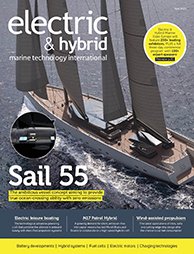 According to Fraende, the crafts’ electric motors not only “enable excellent maneuverability for reaching a safe position or for rescuing passengers or ship personnel in the water, but are quieter in operation and more reliable, requiring far less maintenance. They also pose less of a fire risk and reduce evacuees’ exposure to harmful fumes. Inside, there’s strong focus on comfort, with triple the air space of existing lifeboat solutions, for example, and a novel natural ventilation system”. Since 2009, more than 50 prototypes have been created and undergone numerous tests, including using jet engines to assess how they stood up to 150km/h (93mph) winds. Following completion of the HWST, the system’s container will be assessed and final approval determined by the DMA.